Manufacturing and distribution companies often make use of Microsoft Dynamics GP as their back-end system. With distribution companies working between the manufacturer and the consumer, it is important for these businesses to be able to easily track a variety of information. They need to track the products and terms for multiple manufacturers and consumers, including economic ordering quantities and cooperative advertising dollars. This requires more than a stand-alone back-end system like GP. Today, consumers expect on-demand, custom-built products, fast shipping and the ability to use the Internet to make their purchases. This places a lot of pressure on the manufacturing and distribution industries to reestablish value proposition and increase efficiency. Even if these industries aren’t selling directly to the everyday consumer, they may still benefit from adding an eCommerce layer to the business to achieve these goals. Being able to quickly and efficiently fulfill a customer order is important to manufacturing and distribution companies. When you add a layer of eCommerce to your business structure, you will make it easier to pick items and fulfill orders. Implementing this layer of eCommerce will cut down on warehouse and storage costs and maintenance, allowing you to increase your bottom line. In many cases, distributors choose their ERP vendor for their eCommerce solution to ensure their store will seamlessly integrate with their ERP system. Another common problem in manufacturing and distribution is the number of systems you must handle. In some cases, you must enter the same information multiple times in the different systems. After you use your ERP to implement an eCommerce site, you gain the advantage of entering the information once, while it updates in all systems. With proper integration, all your systems, from your back-end to the front-end, will instantly update when information is added into one, allowing you to monitor everything from one system. This advantage increases productivity and efficiency in your business, improving your bottom line. Microsoft Dynamics GP is meant to be a whole-business solution that can be customized to best meet your individual needs. With the addition of an eCommerce layer, you will build an end-to-end solution that really has an impact on your business model. Orders can be processed in more locations than just the back end. An eCommerce solution in conjunction with GP allows for easier order processing and data entry. Introduce promotional activities that aren’t available without an eCommerce solution to increase your sales. Adding an eCommerce layer allows manufacturers and distributors to create online catalogs to display products and offer special promotions. Sell through multiple channels, a feature that isn’t available when using Microsoft Dynamics GP alone. Gain support to sell through various marketplaces online. Implement cross-selling and up-selling, which isn’t an option for a stand-alone GP system, improving your level of customer service. The use of eCommerce with GP allows you to implement SEO techniques, including Meta tags, so your products can be found directly through the search engines. Manufacturers can set solid models for distributors to follow to streamline the process for everyone. Automatically run and track email campaigns to bring in more traffic and sell more products. Instantly find out all the information you need, including product information, inventory levels, order status, shipping status and even delivery, all of which is unavailable through GP alone. With all the above-mentioned advantages, it makes sense to integrate your current Dynamics GP system with a quality eCommerce solution. 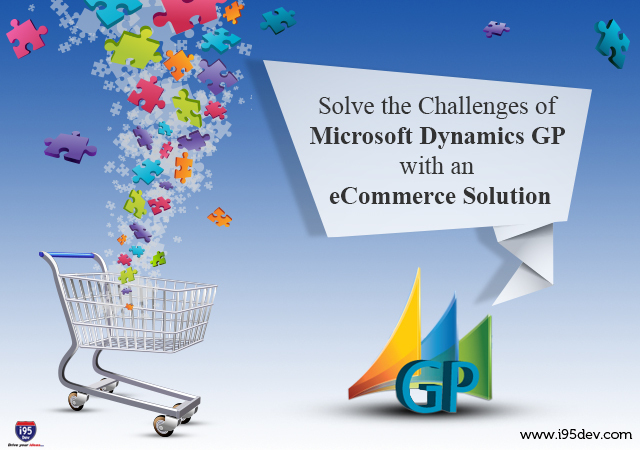 An open source ecommerce cart like “Magento” and Microsoft Dynamics GP were designed to work together, unlike other third-party eCommerce solutions. Click here for more information on how to integrate your Microsoft Dynamics GP with the Magento-based store for real-time updates and the possibility of managing all your operations from one platform. Imagine only having to monitor and maintain one system rather than multiple systems on an everyday basis! i95Dev offers a complete suite of integrated ecommerce engine for Microsoft Dynamics GP, NAV and AX. This powerful & feature-rich open source commerce solution allows brands from retail, manufacturing, distribution and wholesale trade to sell online in B2B and B2C markets through the use of Microsoft Dynamics ERP, Multiple Web, Mobile and Facebook stores, as well as third-party marketplaces, such as Amazon & eBay in more than 60 languages with tight integration between all commerce channels for a seamless real-time approach. Get in touch with the i95Dev experts today!